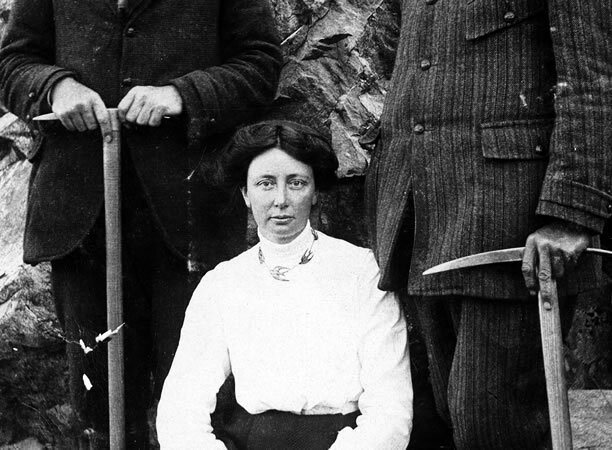 In the cold, dark hours before dawn on 3 December 1910, Freda du Faur and her guides Peter and Alexander (Alec) Graham left their tent and started towards the summit of Aoraki/Mt Cook. Later that day, du Faur stood by herself on the peak after becoming the first woman to complete the ascent – in record time. The path to du Faur’s achievement had begun two years earlier. Interested in climbing as a youngster in Australia, du Faur had been inspired by photos of the Southern Alps to try mountaineering. She trained with the Hermitage’s chief guide, Peter Graham, in mountain climbing. For three months before the attempt, du Faur also trained under Muriel Cadogan at the Dupain Institute of Physical Education in Sydney. Du Faur came from a well-off background and had the financial resources to train and travel. But as a woman, du Faur also faced many disadvantages. She compromised on clothing by wearing a below-the-knee skirt over the knickerbockers and long puttees which were sported by male climbers. On her first major ascent (to Mt Sealy), other women at the Hermitage insisted she should not spend a night alone with a guide, even one as morally upright as Peter Graham. The chaperon, a porter, proved an incompetent climber and had to be held up by Du Faur on the rope when he slipped. We have 15 biographies, 5 articles, related to First female ascent of Aoraki/Mt Cook.